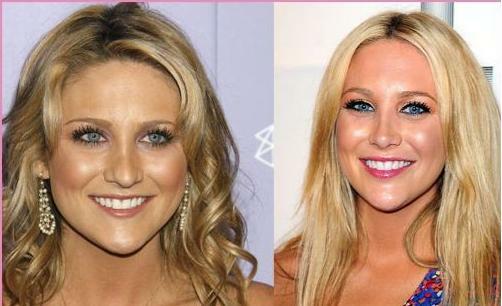 Apparently there is a log of buzz regarding Stephanie Pratt’s Plastic Surgery. I personally think she looks great. Based on the pictures I think that she might have had some refinement of her nose which looks very well done. She also might have had some lip enhancement with injectible fillers (restylane / juverderm / perlane / cosmoderm / collagen). Whoever did her lip injections did well. Many hollywood stars are getting their lips changed in a way that doesn’t enhance their looks in my opinion. You can see my theory on facial beauty at this link: http://www.drphilipyoung.com/pdf/circles_of_prominence.pdf. This can be found on my website: http://www.drphilipyoung.com/harmony.html. Most stars get their lips enlarged so that the upper lip is close to the size of the lower lip. If you take a look at someone next to you, what you will notice is that most of the light is directed at the lower lip. Hence the most attention shouldbe on the lower lip. This can be seen in Stephanie’s photos as well. You never want to make the upper lip the same size as the lower lip. The attention is taken away from the lower lip and ends up breaking up the balance in the mouth region. The upper lip should be half the size of the upper lip at most. The highlight of the puckering should be no more than 3 iris widths (the colored portion of the eye) otherwise the viewers mind will interpret the lip as being too big. Stephanie Pratt and her rhinoplasty/ nose job? From the looks of the picture, it appears that Stephanie Pratt has some changes to her nose which could very well be from a Rhinoplasty. From my eye, her nasal tip looks significantly different. The tip is rotated higher and it is smaller in size. Also the upper portions of the nasal tip has been made smaller as well. Her bulbous tip has been refined so that is is closer to the size of her iris. It is a really good job done by her plastic surgeon. She does have a narrowing in the area above her nasal tip that could have been improved to a little larger width like the rest of her nose and hence have more harmony for the entire nasal bridge. Based on my theory on facial beauty called the Facial Beautyher tip is near ideal size and shape! Posted in Hollywood Plastic Surgery / Hollywood Stars, Rhinoplasty / Nose Surgery / Nose job / Nose Reshaping / Nasal Reshaping, Stephanie Pratt | Comments Off on Stephanie Pratt and her rhinoplasty/ nose job?